My first choice dress proved to be beyond my budget, this was second choice and it has served it’s purpose. I certainly didn’t plan to save it for my daughter, she has her own unique and charming style. Originally I wanted to remake it for my 25th anniversary, but didn’t quite get around to it. It actually still fits, well, sort of. It’s a little snug in some places. 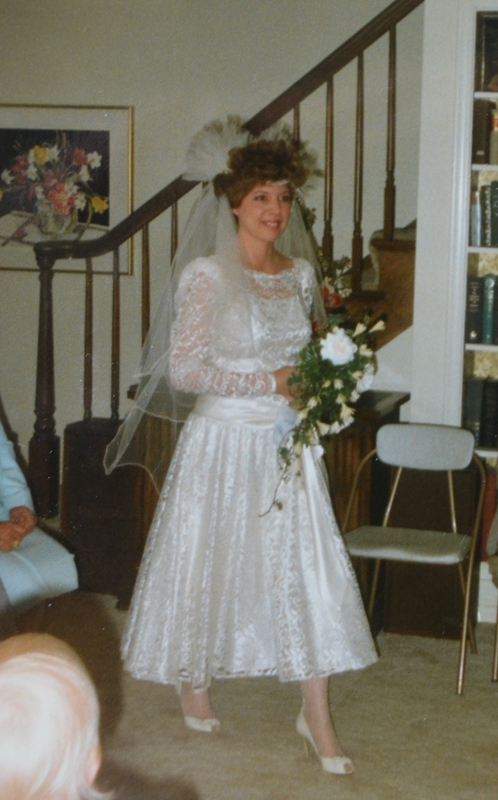 With the low cut back, I was braless on my wedding day, but that was a much perkier time. Yep, kept the shoes too. They fit better than the dress and are classic enough to not to scream any certain decade. The dress had a few problems. 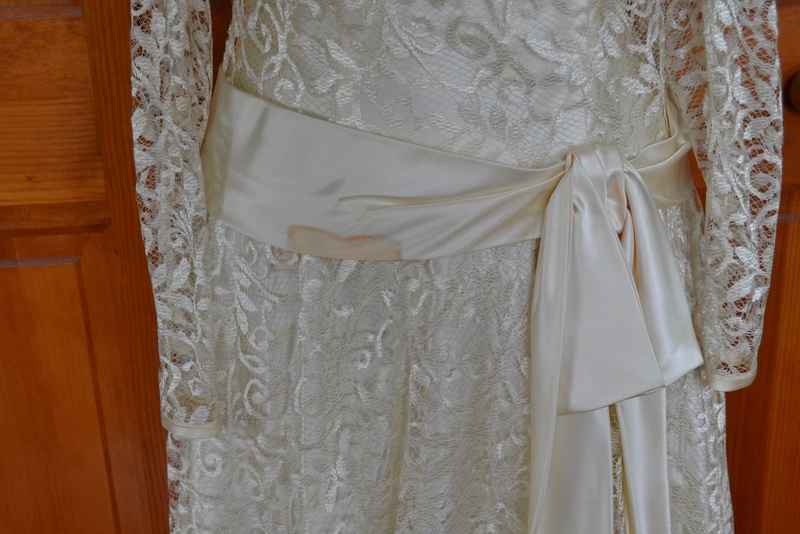 There was large stain, which came out of the lace after soaking in Oxiclean. On the satin it just faded, but was still visible. The construction is pretty poor in the bodice, but at the time I’m sure I didn’t notice. 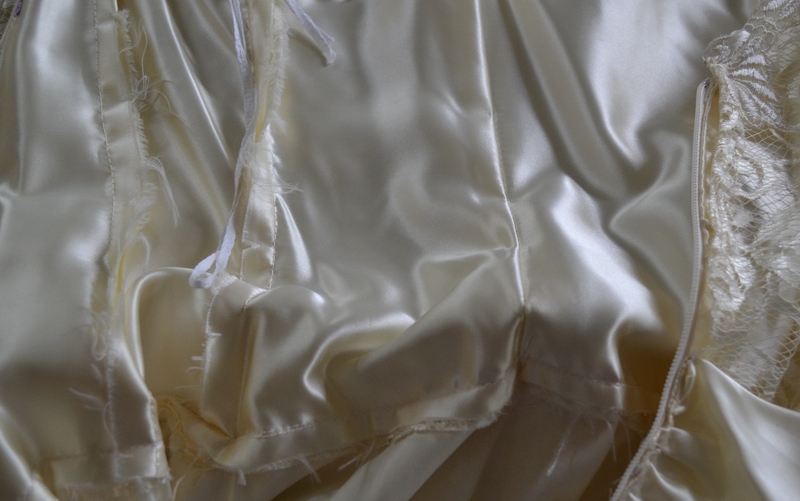 Some of the seams were falling apart, especially on the sleeves, with no lining supporting the seaming. French seams here? Not a chance. 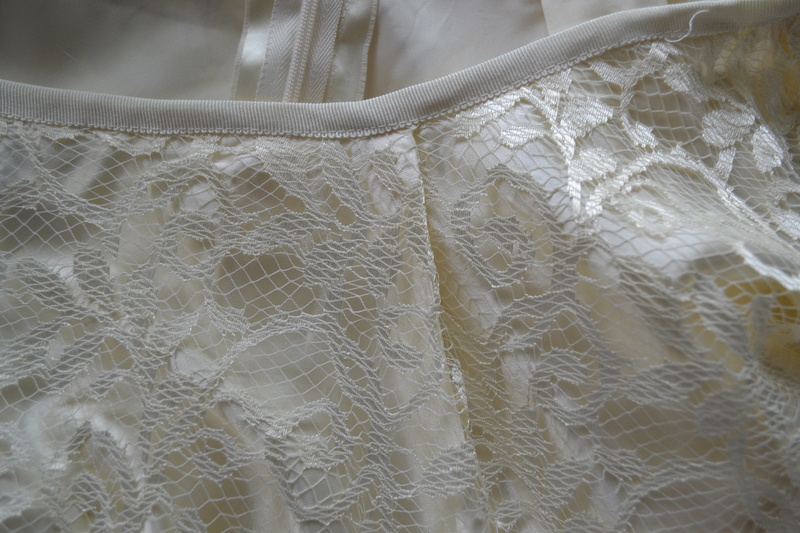 The skirt was in decent enough shape and it was very easy to pick open the seam to separate the skirt and bodice, still keeping the lace and lining together. The original zipper was removed and a new 7 inch zipper inserted. 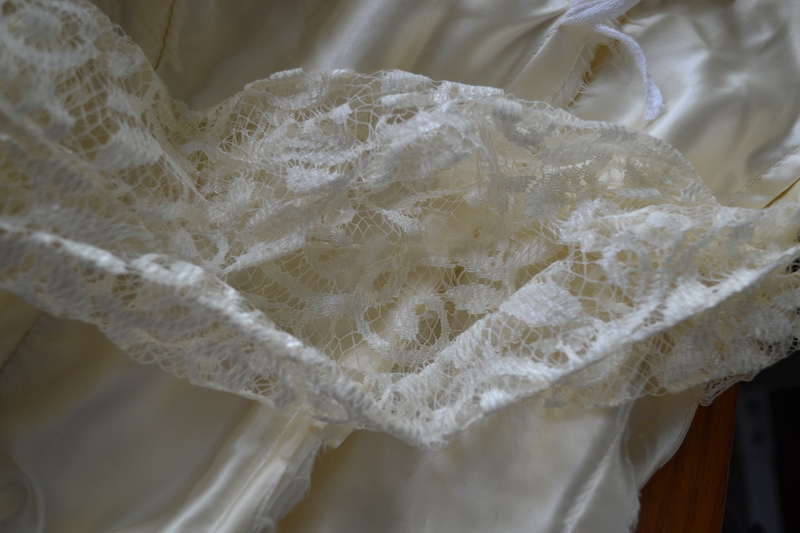 Measuring out petersham ribbon to fit around my waist, I pinned it to my dress form. Then I pinned the skirt to the petersham, making 2 pleats in the front and 2 in the back, so the waistline fit to the petersham. Foldover and stitch down the petersham, add a hook and eye and it’s done. Very fast. I wore it out to dinner at the very old school Detroit London Chop House, with a top a made from a vintage 1964 McCalls pattern. I used a blush stretch satin, the shiny side was pretty, but I’ll get more wear out of the more casual looking matte side. So no shine on this top and the lining is more of the same fabric. I could make the top and lining from only 1 yard of 60 inch fabric. The size 12 fit well, just needed a bust adjustment and I added 1 inch to the length to make sure it overlapped the waist of the skirt. Anyone else prefer the 60’s over the 80’s? I really like the ivory and blush together, but it tends to wash out in photos. My husband took some pictures, 9 actually. My eyes are closed in every one. After 28 years I should know better than to ask him to play photographer. This was my look for day 2 of Me-Made-May. Had to put it back on the next day for one quick photo, as the camera battery died. A perfect remake! Weren’t those styles from the 1980s a hoot? However you looked wonderful then and now! Thank you. Do you think with all the 70’s influence in fashion right now, an 80’s comeback is next? Thanks. I’ve been doing the Konmari method too. It has inspired turning the unused into useful or getting rid of it. The lace skirt looks very current and stylish. Great remake. 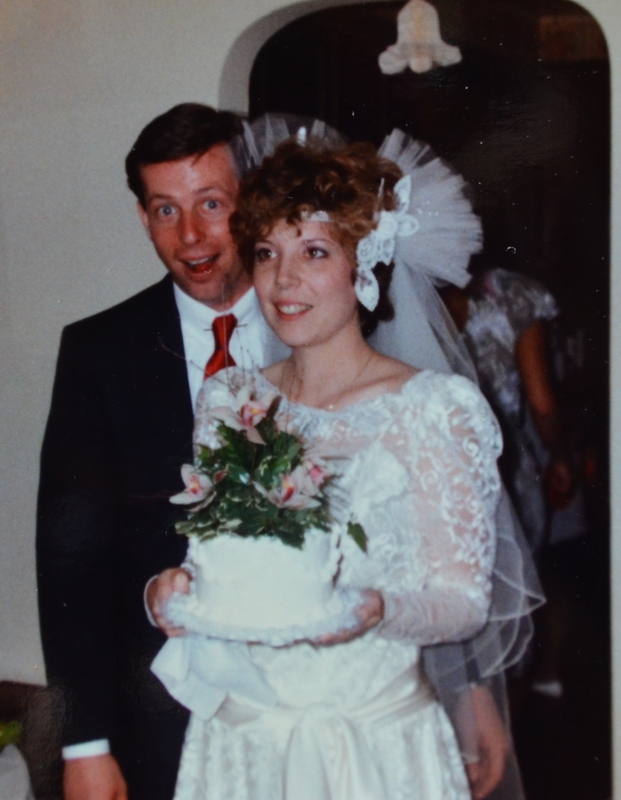 Thanks for sharing your wedding photos and happy anniversary. Thanks, the 80’s are my decade of regrettable fashion. So glad lace is everyday fashion now. You still look every bit as beautiful 🙂 What a lovely idea. 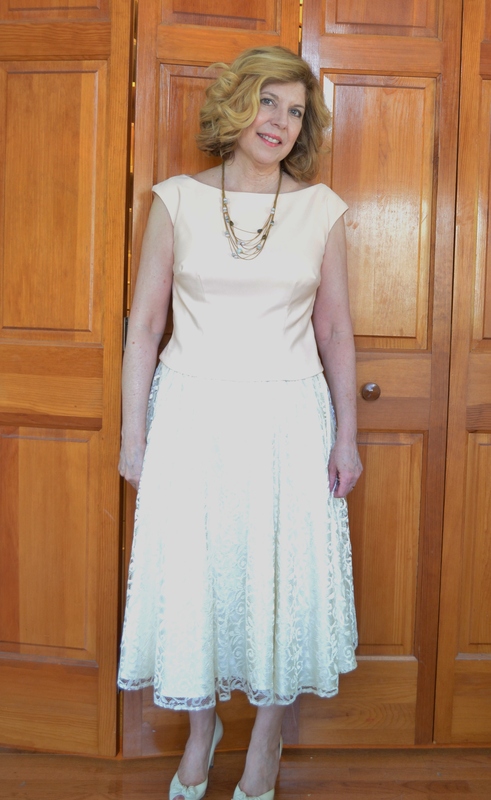 That simple shaped top really compliments the full skirt, especially in the pretty pale pink. 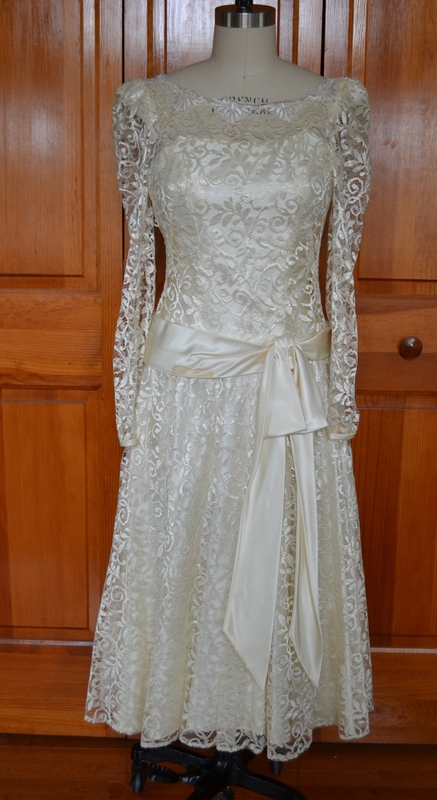 Mine’s still languishing in its box at my parents, but I’ve worn the shoes many, many times for other people’s weddings. Thanks so much. The top is something I will make again, a good summer item. How fun with the shoes, a little piece of your own wedding every time you wear them. Ahh I’m glad you’re wearing your dress again – kind of! 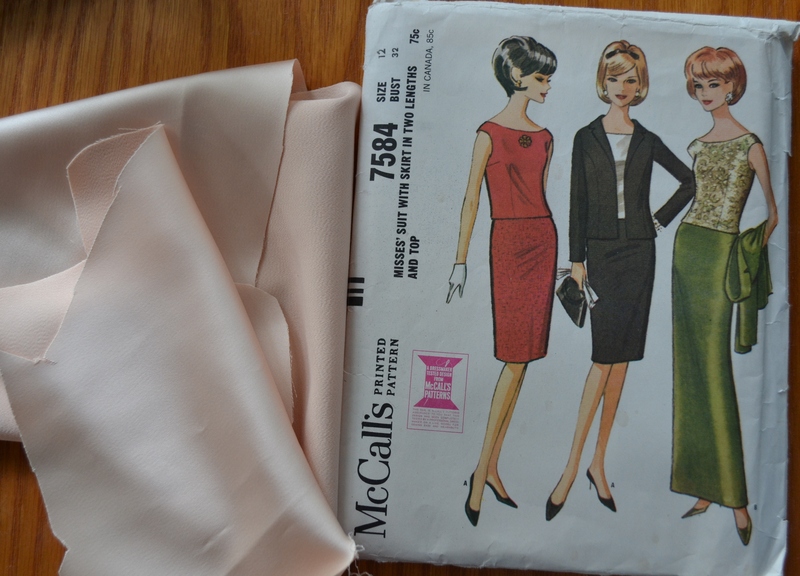 The skirt looks lovely with the pink top. Very pretty. Thank you. I saw the ivory and blush color combination on Pinterest and really liked it. 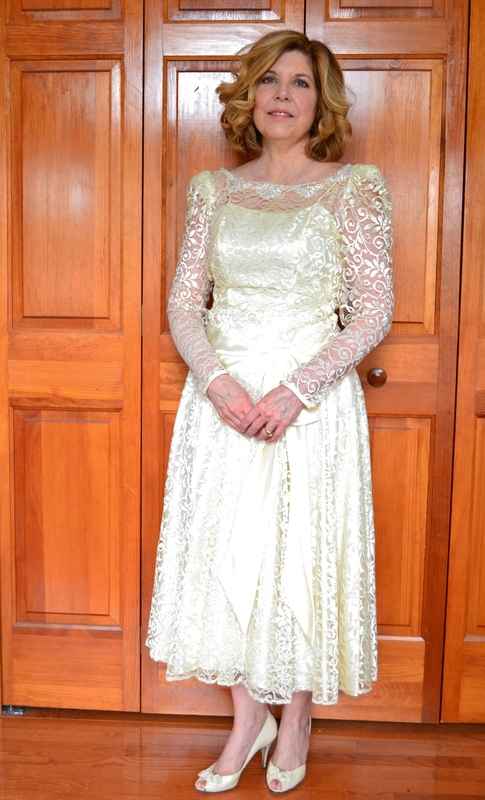 It was fun to wear at least part of the dress again. If I ever have the chance to go wedding dress shopping with my daughter, I will definitely look at construction. Thank you, but I could really use a blog manager. You’re lucky to have the help. Ha! I might have to hire her out! Bit of a distance to you!!!! 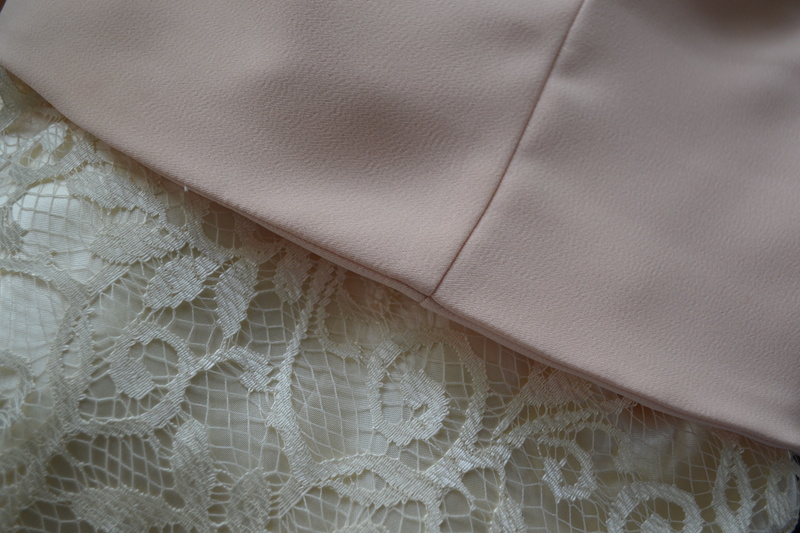 The blush and ivory are so pretty. I love the way you updated the look. 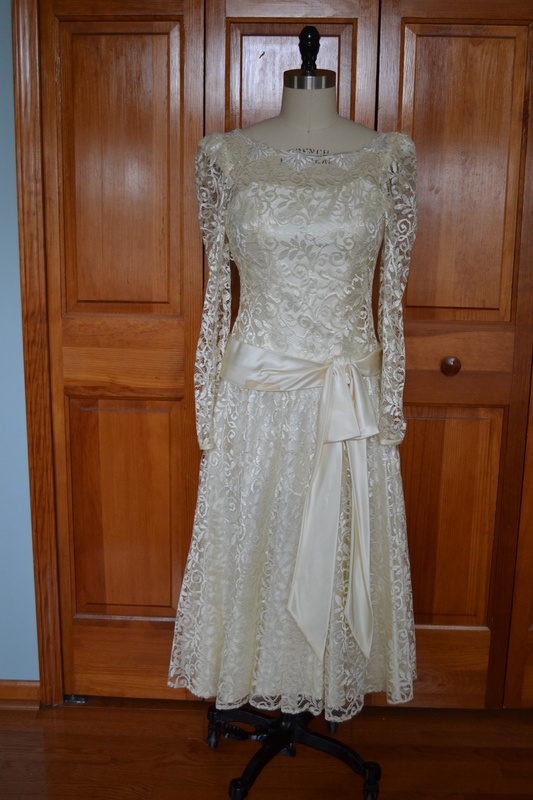 Although the original was sloppy on the inside, it sure looked pretty when you wore it! Thank you, it’s was a lesson in how the inside really matters. 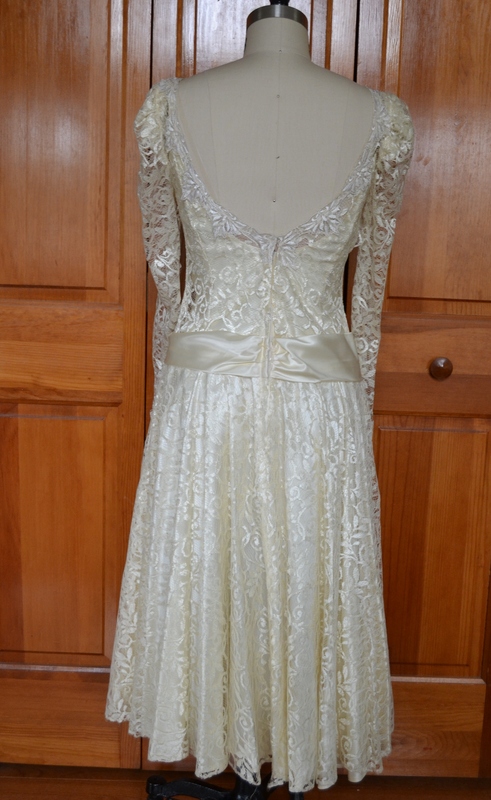 A couple of those wonky seams made the dress hang uneven.